In rural parts of Africa and Southeast Asia, sanitation and education are deeply connected. Almost 2.5 billion people, one in three people in the world, lack adequate sanitation. Children are especially affected by the lack of this basic human need. Not only can the lack of adequate sanitation enable disease to impede a child’s physical and cognitive development, it can also prevent the child from attending school. About 443 million school days are lost each year due to water-related illness. In 2001, there were 115 million primary school-aged children not attending school, two-thirds of them girls. While the number of children out of school has decrease in the past 13 years, thanks to the concerted efforts of many dedicated to universal education, millions of children remain unable to attend because their schools or homes lack basic sanitation facilities. Most of the primary school-aged girls worldwide who are not enrolled in school live in South Asia and Sub-Saharan Africa. Water is intimately linked with education and gender equality. Girls who have to spend time gathering water for the family tend not to be in school. And where schools have sanitation, attendance is higher, especially for girls. Water is connected to health, since millions of children get sick and die every year from water-borne diseases and for lack of basic sanitation and hygiene. Sanitation is a key factor in keeping girls in school. Over half of the girls in sub-Saharan Africa who drop out of primary school do so because of poor water and sanitation facilities. 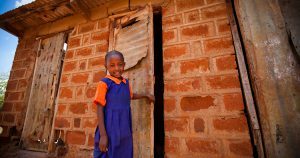 Often girls are forced to drop out of school or miss school once they reach puberty and begin menstruation due to a lack of separate latrine facilities and sanitary supplies. The sanitation crisis however does not only affect girls, providing adequate sanitation to all children and thereby reducing cases of diarrheal related diseases would add nearly 200 million days of school attendance annually. One of the most successful methods of teaching children about proper sanitation and hygiene has been the introduction of student-led school sanitation and education health clubs combined with latrine and handwashing facility construction. Through their input and desire to learn, children are the most powerful resources in schools and communities as they struggle for safe water, adequate sanitation and hygiene education. Combining proper sanitation and education allows children to lead healthier lives and stay in school longer. Lifewater is engaging schools across Africa and Asia with the materials and knowledge to access and maintain safe water and sanitation facilities, as well as the tools that empower children to share their resources and knowledge with their families. WHO and UNICEF Joint Monitoring Programme for Water Supply and Sanitation, Progress on Drinking Water and Sanitation: 2014 Update (Geneva: WHO Press, 2014), 8. United Nations Development Program (UNDP), Beyond Scarcity: Power, poverty and the global water crisis. Human Development Report (2006), 6. Julie Fisher, “For Her it’s the Big Issue: Putting Women at the Centre of the Water Supply, Sanitation, and Hygiene. Water, Sanitation, and Hygiene Evidence Report.” Water Supply and Sanitation Collaborative Council, March 2006, 15. Kofi Annan, “Remarks of the Secretary-General of the United Nations at the 12th UN Commission on Sustainable Development New York, April 28, 2004,” http://www.un.org/News/Press/docs/2004/sgsm9280.doc.htm. UNICEF and WSSCC, “Women, Water and Hygiene Are Key to Change in Africa”, Joint Press Release, Sept. 14, 2005, http://www.unicef.org/media/media_28260.html. UN WATER, “Sanitation: a wise investment for health, dignity, and development” (2008): 4.